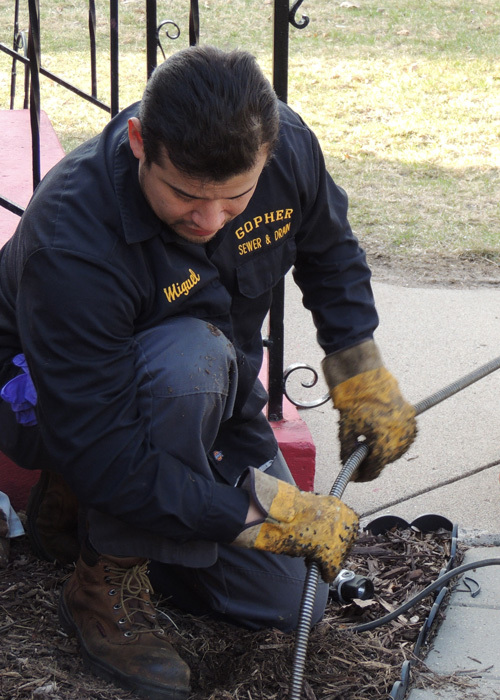 Gopher Sewer & Drain provides fast and reliable service to resolve drain problems in your home. We understand that sewer line backups and clogged drains are stressful, inconvenient and can happen at any time, day or night. We want to solve your problem quickly, effectively and at a price you can afford. If you are experiencing a clogged main sewer line that is affecting all the pipes in your home, or simply a shower that just won't drain or a toilet that won’t flush, here at Gopher we have the tools and the know-how to quickly fix the problem so that you can get on with your life. We provide free, upfront quotes and an honest explanation of the problem at hand, so you can feel confident you are receiving the correct service at an affordable price. Don’t have emergency drain cleaning needs today? We also provide routine maintenance cleaning of your drains and sewer lines to prevent problems from occurring in the first place. Are you a new homebuyer? We can run a camera inspection of the pipes in your prospective home to make sure you are aware of any potential problems and avoid any inconvenient surprises. No matter what the problem, Gopher has a solution that will work for you. We provide free quotes, upfront pricing and guaranteed work to leave you with the peace of mind that your problem has been resolved in the most effective manner. For honest, reliable service, call Gopher Sewer & Drain 24 hours a day, seven days a week.